Is it safe to eat canned foods if some of the food is sticking out above the canning liquid? Probably, if it meets certain criteria. Can I create my own canning recipes? Yes, as long as you follow specific guidelines. High acid foods are generally safe for the home canner to experiment with, low acid foods can be dangerous and even deadly without correct safety testing. Is it safe to use older canning recipes? Lisa explains what to look for in a recipe to avoid food poisoning. My (grandma, mother, aunt, cousin) always canned (x, y, z) food this way and never got sick. Why can't I use their recipes? Unfortunately, for a number of reasons, many new pathogenic bacteria and viruses have developed in recent years that canners didn't need to contend with in the past. We need to be aware of this and adjust recipes accordingly. This book explains how. What about oven canning or steam canning? Are they safe? These methods are no longer recommended for safe canning, and this book gives clear examples of how each of them can lead to improperly preserved food. What do I need to get started canning? 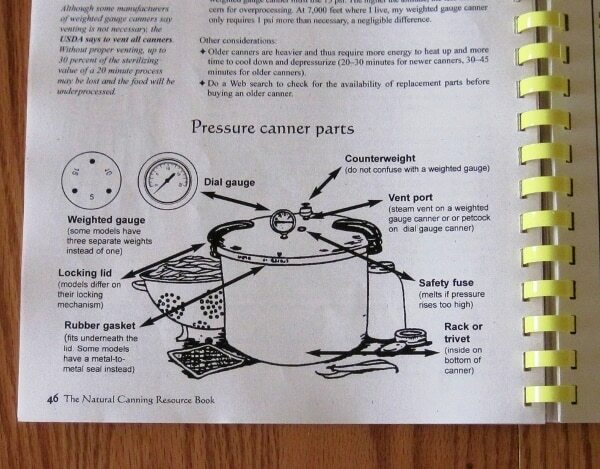 The book includes definitions for just about any term used in canning, as well as charts and diagrams, such as the one below specifying parts of a pressure canner. If you're into living green and walking a bit off the beaten path, this is a great resource. There are two pages dedicated to biocompatible cleaning and polishing recipes that are safe to use with greywater systems. Want to try making sugar from homegrown sugar beats? Lisa gives basic instructions on how to do it. Got lots of sunshine? Check out the section on solar canning. 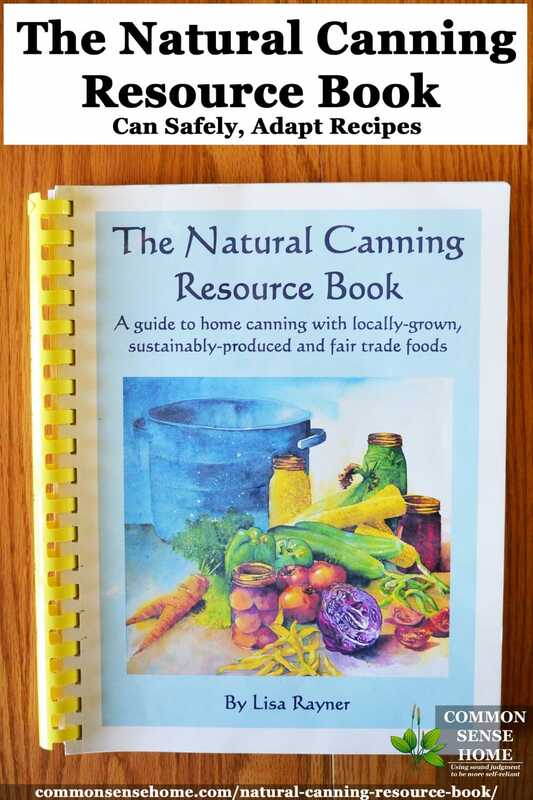 What's in The Natural Canning Resource Book? This book is not a recipe book, although a few recipes are included. 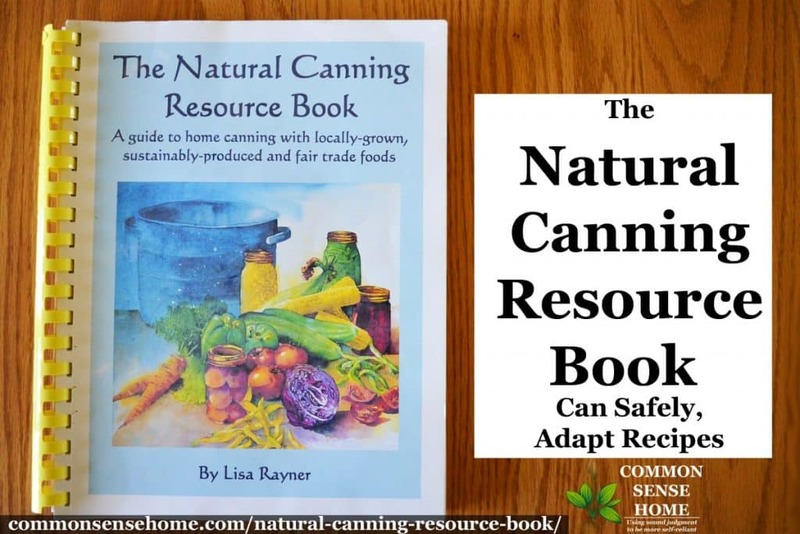 The author recommends using the book in conjunction with the USDA Complete Guide to Canning and Preserving and other publications. Is there anything I didn't like about The Natural Canning Resource Book? Yes. In the first section, the author goes on a bit about man-made global warming. While I firmly believe we need to be responsible stewards of the planet, I also believe the sun has much more to do with the temperature than we do. One has only to study history to see that the climate has varied significantly over time. The author also discusses peak oil and fossil fuels. Again, while I agree that ending our dependence on foreign oil would be a very good thing, I do not believe that the term “fossil fuel” is completely accurate. We find so-called “fossil fuels” (hydrocarbons) on other heavenly bodies, such as Titan. Finally, the author expresses an interest in ramping down the level of technology used in society via the Transition Movement, which seems like yet another version of the Luddite movement. I'm for combining the best of old and new to use less energy when possible, but also produce more energy to bring up the standard of living around the world. This books is a great resource for everyone from beginners to experienced canners. As I said, it answered many questions that I had not seen answered in any other other source. Small batch canning, large batch canning, substitutions, community canning, selling your canned goods – it's all covered. If you truly want to understand exactly how canning preserves your food, this is the book for you. I hope you've found this review useful. I know my copy will be sitting at the ready on my “go to” resource book shelf. A book like this is needed out there….thanks for the review. I'm glad you found the review useful. I'm certainly glad to have found this book. It's great to have all these answers in one spot. This looks like a great resource. I had to have a friend hold my hand — and still gives me counsel — until I got the hang of it. It can be quite intimidating. This is exactly what I need. Does anyone know where to buy it? Amazon wants alot for theirs. The author sells it directly from her website (http://www.lisarayner.com/), but it’s actually more expensive there. Otherwise, I haven’t seen it anywhere else. The only thing I might suggest to get the cost down would be to share it with a friend or friends who also can. It’s a book I highly recommend to all home canners. Thanks for the recommendation. This sound like exactly what I’m looking for. I’ve been wanting a book that is less about recipes and more about teaching me how to make my own, safely. I know I was really glad to find it because it answered so many of the questions that I had.